Mayor Rahm Emanuel announced a new branch library on the Near West Side and new fire station on the Near North Side are being planned through public-private partnerships with local developers. The projects are in addition to the new Fleet and Facility Management (2FM) that will be constructed in Englewood, utilizing funds from the sale of city-owned land at 1685 N. Throop St. The library, planned for a 16,500-square-foot building at 118 N. Aberdeen St., will serve the Near West Side’s rapidly growing residential community. The two-story property will be rehabilitated for library use in an effort led by owner Sterling Bay and provided to the Chicago Public Library system, pending the City’s review and approval processes. The new library facility will offer a built-out early childhood active learning space, and programs and spaces for area children, teens and families. Free one-one-one homework assistance will be provided for school-aged children through the Library’s Teacher in the Library program. 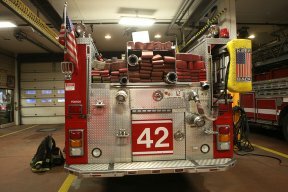 On the Near North Side, work is being planned on a new, state-of-the-art Engine Co. 42 fire station at the base of a new mixed-use tower in the heart of River North. Both projects will be subject to standard review and approval procedures involving the community, the Chicago Plan Commission and City Council. Planned by developer Friedman Properties Ltd., the new station would rise immediately west of the existing Engine Co. 42 station at 55 W. Illinois St. After the new station is completed, work would begin to replace the old station with up to 614,000 square feet of office and mixed-use space. 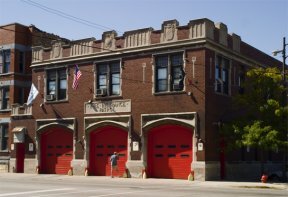 The cost of the $20.2 million fire house would be paid for by Friedman Properties.